Last Unit A small and exquisite residential complex of 26 Townhouses, all built with highest quality, a private lift with direct access from the garage. On the top floor there are 2 double bedrooms, both en-suite, one with a jacuzzi bath, fitted wardrobes. The master bedroom has its own terrace. There is a brand new fitted kitchen on the ground floor leading through to a large living area with an open fireplace and direct access to the partly covered terrace. There is a separate guest WC on the ground floor. In the large basement a large bedroom with en-suite bathroom could easily be converted into a play area for children or a games room. The purchase price of each Townhouse includes a private garden and a garage. 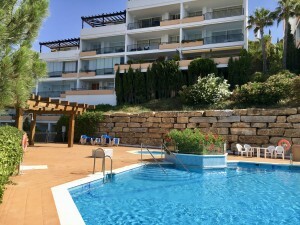 This gated and secure community is located close the beautiful beaches of the Costa del Sol and only a few minutes´ drive to Puerto Banus and San Pedro. Golf Courses and other amenities,including the sophisticated leisure and shopping centre Laguna Village, are all in close distance.